Mounds, so good, slightly exotic and one of the few “Peter Paul” (now owned by Hersheymonster) candy bars. It’s such a great combination of ingredients I’m surprised it hasn’t been copied more. I like Almond Joy but I’m a dark chocolate girl and Mounds has always been one of my favorites. 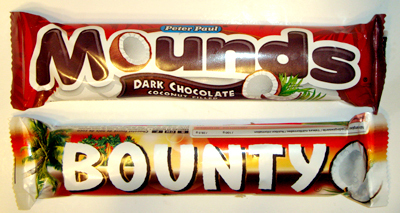 Bounty is a Mars (not yet bought by Hershey) product and like Mounds, also comes as a two-piece candy bar. I’ve seen Bounty before but Ethan wasn’t familiar with it. I’ll say it’s because he grew up in New Hampshire and the Bounty truck didn’t bother delivering to the woods. These have a nice soft bite to them. The chocolate provides a firm shell around a soft, moist coconut mixture that is just sweet enough without going overboard. The chocolate flavor is smooth and rich which is the right amount to not overpower the taste of the coconut. Biting into these, it was clear that the coconut was drier. The flavor of the coconut was okay but the dry texture didn’t seem to smush with the chocolate so well. The chocolate looked better than Mounds but did not have as much flavor. To be fair, I will say after it was in my mouth for a bit some flavor came through but it wasn’t as pronounced as Mounds. Mounds takes this match. Ethan and I liked the moist texture of the inside and I really thought the quality of chocolate was better. Bounty wasn’t terrible but the coconut was dry enough to cost it some points (if I used a point system) and for the fact that the chocolate only surrendered it flavor if you kept it in your mouth for a bit and worked it. Not a bad substitute for Mounds but I can see why they’re not as common. I think Mounds is moister because the filling has more sugar. I adore Bounty bars because I prefer the milk chocolate, but I also think the coconut flavor shines through because they’re not as sticky sweet inside. Just for clarification, this Bounty Bar is also dark chocolate. The Milk chocolate version comes in blue wrapper much like Almond Joy (which is milk chocolate) is in blue too. I like both of them. They’re a little different but both satisfying. I don’t think that the Bounty bar is a second rate version of the Mounds. It’s just the Mars version. The bounty in australia is quite moist, not dry at all. But we don’t have mounds. Our dark bounty comes in a red wrapper, the milk in a blue wrapper, and at one stage we had a cherry-coconut bounty but it was limited only. What the hell us Bounty? All American coconut is second rate though… to borrow from Steve Almond, it has the texture of dried cuticle. If you want decent coconut, get an import bar like RitterSport. In Germany we don’t have Mounds (just googled it because of the jingle (sometimes you feel like a nut, sometimes you don’t)) we just get bounty. But still, the best coconut-bar i’ve ever had is the australian CherryRipe. I imagine mounds would taste better to American tastebuds, while bounty would appeal to European ones. Since WW2, very sweet chocolate has reigned supreme in the US, it was originally produced with sugar as a filler because cocoa was more expensive during this era, culturally it just stuck. Europeans will say that Hershey’s chocolate is too sweet, while a lot of Americans will say that European chocolate is bitter and tasteless. As an American tourist, I am beginning to agree more with sweets abroad in taste and texture than with the over the top American sweets. You’re making it sound like Bounty is a rip-off of Mounds. Bounty has been around forever. I have literally never even seen a Mounds bar. The only reason I know about it is because of a Louis CK piece. So I googled it and it looks like a disgusting rip-off of Bounty!